Use VI Package Manager to install this utility, which includes 13 different bencharmks, each of which contains multiple versions. Some are written in LabVIEW - others are written in C. It is designed to make it easy to add your own and includes a template and built-in reporting capabilities. 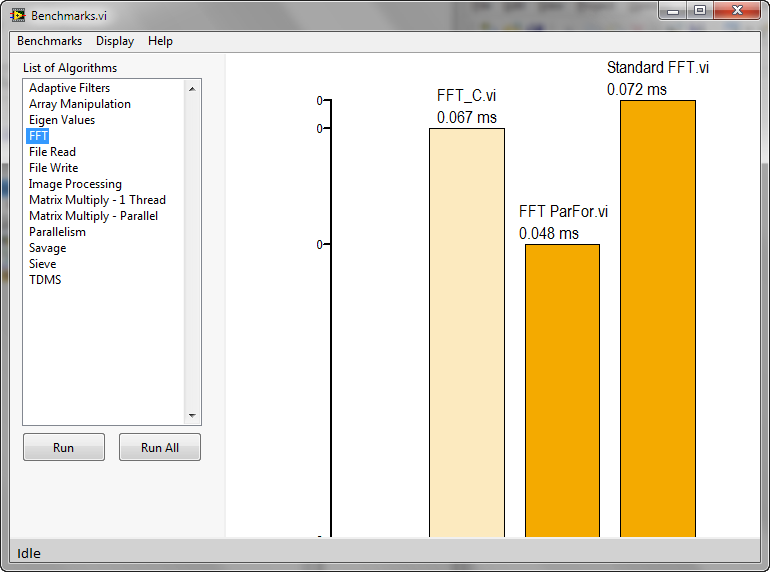 Note: the Bar Graph I used in this application is stolen from Simon Hogg, the administrator of the UI Interest Group. The "Load Benchmarks.vi" creates a Path of Benchmarks of "C:\Program Files\National Instruments\LabVIEW 2010\project\New Benchmarks". They were installed at: "C:\Program Files\National Instruments\LabVIEW 2010\vi.lib\National Instruments\LabVIEW Benchmarking Utility\New Benchmarks"